Description/Book Blurb: Forty-one years ago, the renowned physicist Dr. Christopher Robin vanished. Before his disappearance, his fringe science theories about the existence of endless alternate universes had earned him both admirers and enemies. Now his widow has died and Alex Benedict has been asked to handle the auction of the physicist’s artifacts—leading the public to once again speculate on the mystery surrounding Robin’s disappearance. Did he finally find the door between parallel universes that he had long sought? 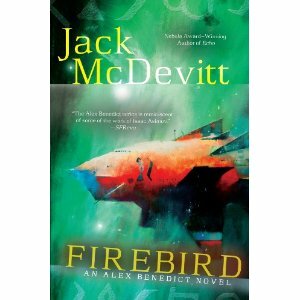 Firebird was a really good mystery/thriller science fiction time travel story. This is a smart story that doesn’t depend on jaunting through time to give you a great time travel story. In fact, aside from one poor soul who accidentally ends up there, the focus of the story is not about the actual experience of traveling through time but how to save those who are stuck traveling in time and the science of how those people became stuck in time. Those who read my reviews know I have a soft spot for time travel pieces, but I believe this one is smart enough and slick enough to interest regular science fiction readers as well and perhaps even those who don’t generally enjoy time travel stories. This is a story about the science of how the universe is made up and some of the possibilities that might be encountered by a society that travels freely through the stars. I don’t know if these things are possible or will be in the future, but it certainly is interesting to think and dream about such interesting and frightening possibilities. 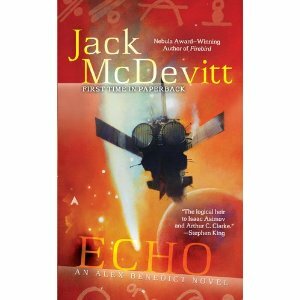 It’s probably pretty obvious at this point that I’m on a Jack McDevitt kick as I just discovered his books recently and have been enjoying the chance to discover a new writer’s voice, characters and stories. I really enjoyed this book and have to say that of the books I’ve read from Jack McDevitt that my favorites are fast becoming the Alex Benedict books. For an antiquarian this character sure finds himself at the middle of a lot of things, but that’s where a good sense of curiosity takes you.